Looking for something different to do with your annual family Christmas letter this year? How about making it in the shape of a Christmas tree? At blog.christmaslettertips.com, you can find simple instructions for making a Christmas letter in the shape of a tree. The instructions are fairly simple and basically involved setting your word processor to center alignment and then typing successively longer sentences on each line. You can also enhance the effect by using colored fonts (green for the tree and brown for the trunk) or by using icons such as stars and circles to represent the tree topper and ornaments. 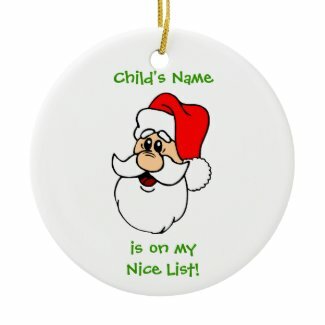 You can create these images with fonts such as Zingbats or specialty Christmas fonts you can download online. It might take several tries to get the exact effect you want, but in the end, you’ll have a fun Christmas letter that your friends and family will love to read. 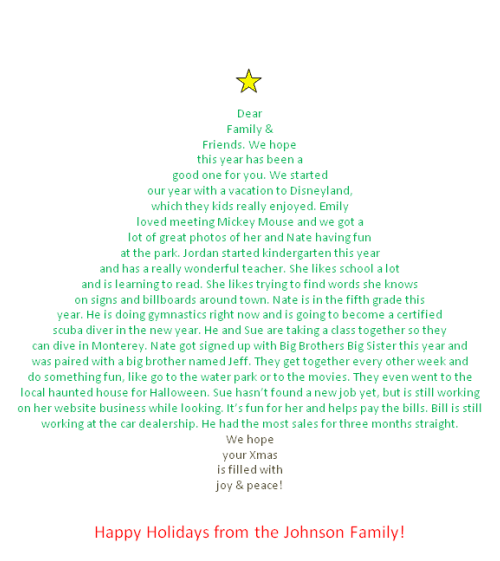 For more creative Christmas letter ideas, be sure to check out the book Ideas for Writing Creative Christmas Letters That People Are Actually Eager to Read by Janet Colbrunn, which includes a variety of fun ideas to make your holiday letters more entertaining for both you and your readers.